Are you looking for a way to work on colors with your preschooler? 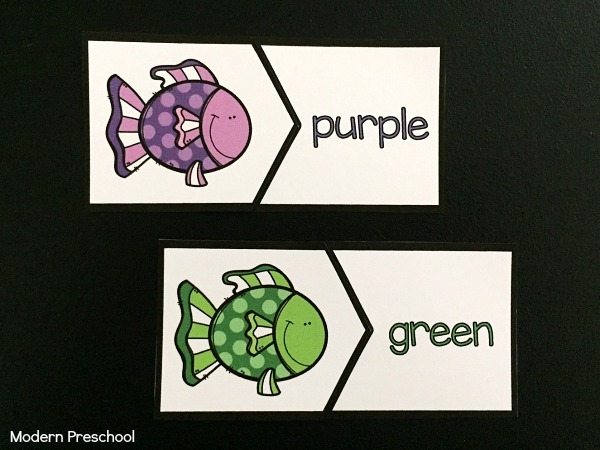 Or maybe you need a quick activity for your kindergartener to use to better understand color words. 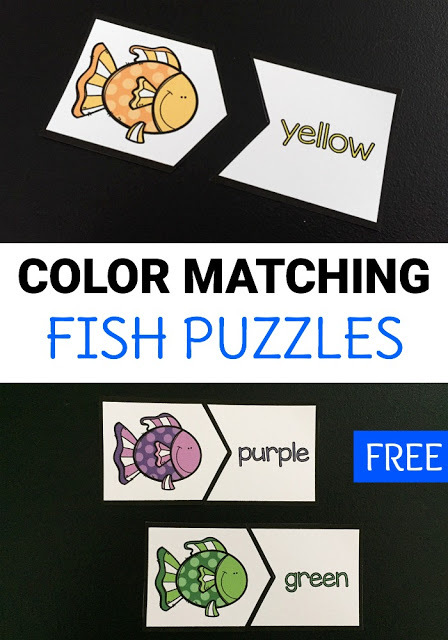 Either way, our printable color matching fish puzzles are the perfect activity for you! They can be used in the classroom or at home as a fun busy bag and take almost no time to prepare! The set of coloring matching fish puzzles includes 11 individual printable puzzles. Each puzzle has a different colored fish on it with the corresponding color word. 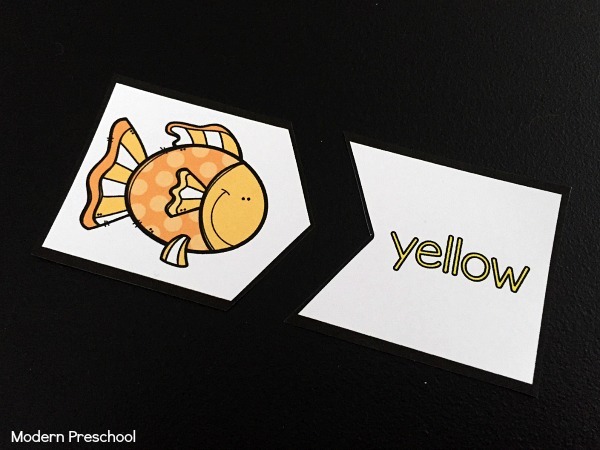 There are 2 versions available to use depending on where your child is at with color word recognition skills. Simply print out the color matching activity from the link below. I printed ours out on white cardstock for extra durability. You can also laminate your set to use over again and again! Cut around each puzzle and then carefully across the middle zig zag line. Print the version of the puzzles that works best for your child! 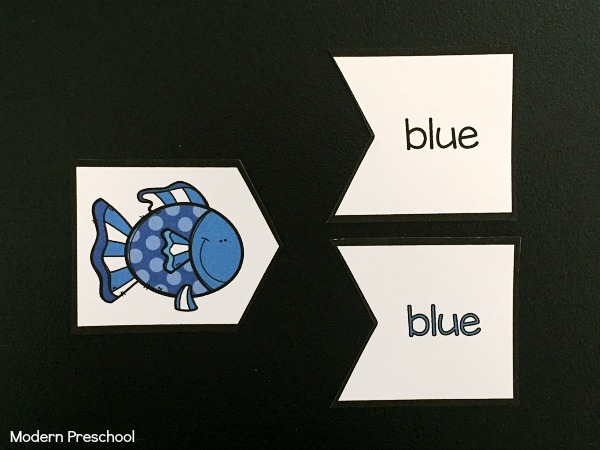 If your child is just beginning to learn about color word recognition, use the version that includes color words written in the color, not just in black. This set helps introduce what the color words look like, and makes the game fun for all levels! For a more difficult way to play, use the set that has all of the color words written in black. 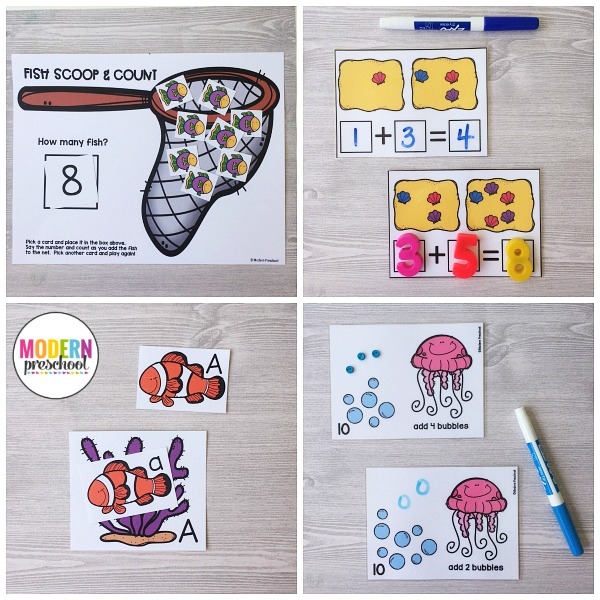 This set is for kids who have mastered or who have almost mastered their color words. It may be overwhelming to introduce color words with this set! In my classroom, I would use this set in a few different ways with my preschoolers. I would introduce the color matching activity during circle time. Whenever I introduce a new activity, I use non-examples mixed in with the actual answers to check understanding. Simple activities like this are set up in a learning center for individuals or small groups to work together to complete. My preschoolers rotate through our table top activities freely during the morning. If I don’t observe certain preschoolers playing with an activity, but still want to check their skills, I’ll use it during a small group time too. Assessing understanding of the color recognition and color word skills can easily be done with the set of puzzles that include the color words written in black. Playing games while evaluating students is way more fun than just answering question after question! Some of our favorite ocean and fish themed books can be found below! 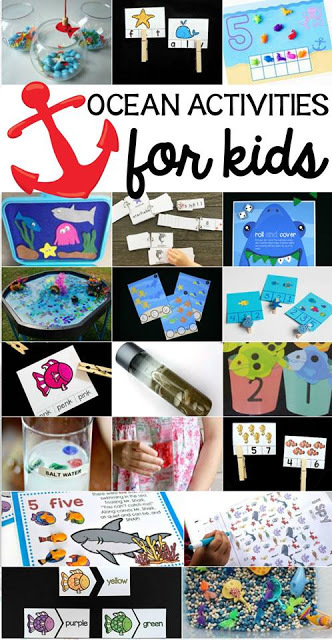 Check out the other fun ocean and fish themed activities from some of my favorite bloggers! Do you need even more fish and ocean learning ideas? Our ocean literacy and math centers are the perfect addition to any ocean theme! The color matching fish puzzles can be found at the pink button below! I really like the fish matching activity, but when I downloaded it, I think the 3rd page should have the words in color. Instead, they are black again.